How Much Money is Enough to Last You a Lifetime? 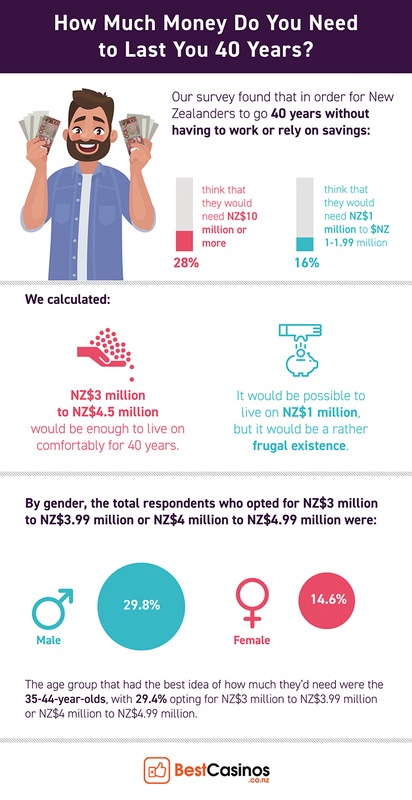 It’s a commonly asked question, and one that many people dream about or aspire to achieve, so we decided to put out a survey for the people of New Zealand to gauge just how much money people think that they need to live their life without the need to work or rely on savings. The complete six-question included questions concerning: how much they think is needed to no longer need to work or rely on savings; how well they’d live if said amount of money was won; what they’d do about their current career; how private they would keep the announcement of their big win; how much they’d give to friends, family, or charity; and if they’d stay in New Zealand. The focus of the questions was around the thinking that X amount of money would last them for 40 years without having to work again or rely on savings, so people in the age groups of 35-44 and 45-54 provided the most acute data for the question as 40 years for them will most likely see them through retirement and to the end of their life, but the other age groups still provided valuable data, which we will also examine. Before we delve into the results of the survey, we further need to define how much someone would actually need to win all at once to be able to live for 40 years. According to the US-based CNBC, it was found that US$1 million may only last someone 12 years, meaning that for 40 years, people would need US$3.2 million, which converts to NZ$4.7 million. Money Wise, a UK finances expert website, found someone who plans to live on £12,000 per year, which would only entail a need for £480,000 (NZ$927,000) over 40 years, but less frugal and more normalised calculations clocked in at a need for £1.6 million (NZ$3.1 million) for 40 years of living. The cultural and societal differences will certainly have their say in these calculations, so the truth for a fair amount to live off of without being overly frugal for 40 years likely sits in the NZ$3 million to NZ$4.5 million range. In New Zealand, the 2018 Living Wage stood at an annual income of NZ$42,744, leading to the baseline over 40 years from this living wage being NZ$1.7 million, but this would likely entail a rather frugal existence, so we extended the range to allow for unexpected expenses, entertainment spending, rent or mortgage payment, basic household goods, and all other expenses that would need covering over 40 years and still allow the pot to last for that period of time. Question 1: How much money do you think you’d have to win to last you 40 years (without having to work again or rely on savings) [in NZ$]? Question 1 was split into seven answers, with participants selecting one of the following: 1 million to 1.99 million; 2 million to 2.99 million; 3 million to 3.99 million; 4 million to 4.99 million; 5 million to 6.99 million; 7 million to 9.99 million; 10 million-plus. As has been famed by American media, people dream of winning US$1 million as it’s portrayed as being enough to solve all monetary problems, so we decided to set the low-end of the survey at NZ$1 million. A dominating 28 per cent of the respondents ticked the 10 million-plus answer, with the next most popular answers being the 2 million to 2.99 million range with an 18.4 per cent of those surveyed, closely followed by the 16 per cent who thought that 1 million to 1.99 million would be enough money to last them for 40 years without having to work again or rely on savings. Across the two categories, a combined 20 per cent of voters saw in line with our calculations of the quantity needed to live for 40 years. The age groups of particular intrigue, 35-44 and 45-54, combined for a majority that saw 2 million to 2.99 million as being the amount needed with 23.1 per cent. 10 million-plus followed with 20.5 per cent, shortly followed by 17.9 per cent going for the 1 million to 1.99 million option. Given the fantasy context of this question, it makes sense that many would select the NZ$10 million-plus option as it’s a huge amount of money reserved for the biggest of wins. Take the world record-breaking jackpots from progressive slot game Mega Moolah, for example; it currently holds the official world record payout at NZ$25.4 million as well as the not-yet officially verified new world record of NZ$31.3 million. In fact, the most recent Mega Jackpot win on the game by a New Zealander clocked in at NZ$8.3 million, which followed fellow Kiwi wins of NZ$1.6 million, NZ$10.1 million, and NZ$1.1 million. Then there’s the added hype around the biggest gambling event in the world, the World Series of Poker, which has offered huge first place prizes of NZ$26.7 million, NZ$22.3 million, NZ$17.5 million, and two lots of NZ$14.6 million since 2006. So while these wins aren’t unheard of, even in New Zealand, they are still considered fantasy and considered in line with the fantasy of never having to work again. Overall, it’s understandable why more people would select the highest value because it would give them more leeway in their day-to-day lives and allow them to live more extravagantly. The highest option was also the safest as the even the least financially or mathematically savvy person would be safe selecting 10 million or more as a big enough win to live off of for 40 years. The two lower values received a strong chunk of the votes, likely representing those who interpreted the question as the amount needed for them to stay exactly as they are now for the next 40 years, or something similar to this notion. To answer this question, 8.2 per cent said that if they won the amount that they selected in Question 1, it would enable them to live frugally for 40 years, 29.5 per cent said that the amount would let them live a moderate lifestyle, 42.6 per cent would live comfortably with the amount that they selected, and 19.7 per cent said that they would live luxuriously. Given that a combined total of 45.6 per cent selected options from 5 million to 10 million-plus, it shouldn’t come as a surprise that the majority (62.3 per cent) reckoned that they could live comfortably or luxuriously for 40 years if they won that amount. Strangely enough, of the group which selected live frugally, 50 per cent were from the group that picked 10 million-plus in Question 1, meaning that they consider an average of NZ$250,000 per year at a minimum requiring a frugal lifestyle. But this somewhat anomalous finding is nicely countered by the 52.4 per cent of those who selected the live luxuriously option being in the 10 million-plus group. Of those who were in line with our estimations in Question 1 (selecting either the 3 to 3.99 million or 4 to 4.99 million option) 47.1 per cent saw these amounts as being enough to allow them to live moderately or comfortably. Question 3: If you won enough money to last you 40 years (without having to work again or rely on savings), what would you do in terms of your career? The voting for Question 3 was split fairly evenly with 27.1 per cent of respondents opting to continue working as normal, 25.4 per cent reducing the working hours at their current job, 25.4 per cent choosing retirement, and 22 per cent changing their job. Across the age groups of 35-44, 45-54, 55-64, and 65-plus, 31.8 per cent selected retirement (the most selected option when combining these four groups), which is understandable as having enough money to see them through 40 years is quite possibly enough to see them to the end of their lives in many instances. The results also showed some disparity between males and females, with 32.6 per cent of males retiring on their selected amount of money to last them for 40 years compared to only 21.2 per cent of females doing the same. The relatively small number of respondents selecting the retire option is somewhat of a surprise given that the premise is that the amount of money that they select is enough to last them for 40 years, with the majority thinking that their selected amount of money should see them live a moderate or comfortable lifestyle. Of the percentage of people who would continue to work as normal, a significant 23.3 per cent also selected 10 million-plus as being a win big enough to see them no longer need to work or rely on savings. This desire to continue to work in some capacity, as shown by 74.5 per cent of participants, could come down to workplace friendships, the need to keep occupied, the voters having a genuine fondness of their job or the prospect of a different job, or the societal influence to contribute and make more money. Question 4: If you won enough money to last you 40 years (without having to work again or rely on savings), would you want it to be publicly announced or kept private? Unsurprisingly, the vast majority of people answered that they would keep their big win private, with 82.9 per cent ticking keep private, 7.2 per cent going for a public announcement of the win, and 9.9 per cent simply not caring either way. Despite the view of younger people being somewhat brash when it comes to money, the largest representation of an age group among those who would make a public announcement was of the 45-54-year-olds at 14.3 per cent, with that same age group being the only one to tally a ‘kept private’ percentage below 80 per cent (76.2 per cent). Curiously, 42.9 per cent who would publically announce the big win also believes that the win noted in Question 1 would only allow them to live frugally for 40 years. Of the vast majority of those who would keep the big win private, a 51 per cent majority would continue to work as normal or just reduce their work hours at their current job. Question 5: If you won enough money to last you 40 years (without having to work again or rely on savings), what proportion would you donate to charity or gift to family/friends? This is the classic question posed to many figurative jackpot winners, and while the vast majority of people say that they would share the wealth with their friends, family, or charity, the results of our survey found that a good portion of those questioned were a bit stingy. Of the respondents, 10.8 per cent said that they would give 0 per cent, 18.0 per cent said that they’d give 0.01 to 4.99 per cent of their win, 19.8 per cent said that they’d give between five and 9.99 per cent, the most popular option was to give 10 to 19.99 per cent with 31.5 per cent choosing this option, and then 19.8 per cent would give up 20 per cent or more of their newfound wealth. It was found that females are generally more generous than males, with 63.2 per cent of all females surveyed opting to tick the 10 to 19.99 per cent or 20 per cent-plus box while only 43.6 per cent of males did likewise. The results revealed the age groups of the most interest (35-44 and 44-54) accounted for 65.7 per cent of the selections of the two most generous options. Somewhat of an odd finding was that 9.5 per cent of those who would give 20 per cent-plus also thought that their big win that would be enough for 40 years would also lead to them leading a frugal life. Question 6: If you won enough money to last you 40 years (without having to work again or rely on savings), would you stay in New Zealand or move abroad? For this question, there was a simple set of two answers: stay in New Zealand or move abroad. A massive 86 per cent of the 107 respondents declared that they would remain in New Zealand if they won enough money that they wouldn’t have to worry about work or rely on savings for 40 years. It shouldn’t come as a surprise that the 18-24 age group was the most venturous, with 33 per cent stating that they’d go abroad compared to only ten per cent of those aged 65-years-old or over. Possibly tied to these findings: 40 per cent of those who stated that they’d move abroad also selected that they’d change their job if they reeled in the big win. While not as low as the 65-plus age group, but only 15.2 per cent of people in the 35-44 and 45-54 age groups would leave New Zealand in this instance. There you have it: if someone was to win enough money to last them 40 years, the majority of people would expect that amount to be in excess of NZ$10 million and for it to allow them to live comfortably. After landing the big win, they’d most likely continue working as normal but would keep their newfound wealth private. But being private doesn’t mean being greedy, as the majority of people would gift 10 to 19.99 per cent of their win to charity, their friends, or their family, most likely staying in New Zealand to enjoy the rest of their money.